Kombucha tea can be quite delicious, really good for you, and strangely addictive! The taste of Kombucha tea can range from fermented apple cider to a vinegary carbonated water. You can control the taste of your Kombucha tea by brewing it yourself. Kombucha tea is not the worst substance to become addicted to, but at $3 or $4 a bottle, it can become pricey, quickly. You can beg a scoby from a kombucha-brewing friend, or you can order a fresh one online. But there’s one more option: you can grow your own. Kombucha scobys look like alien babies. Symbiotic Culture Of Bacteria and Yeast; hence the acronym, S.C.O.B.Y! A scoby is the living home for the bacteria and yeast that transform sweet tea into tangy, fizzy kombucha. Consequently, scoby is essentially the coral reef of the bacteria and yeast world. It a rubbery raft that floats on the surface. Aside from being a home for yeast and good bacteria, the scoby seals off the fermenting kombucha from the air and protects it from outside, undesirable bacterias while it’s fermenting. P.S. You’ll also sometimes hear scobys referred to as “kombucha mothers” or “kombcha mushrooms.” If you read or hear references to these things, know that it’s all the same thing. 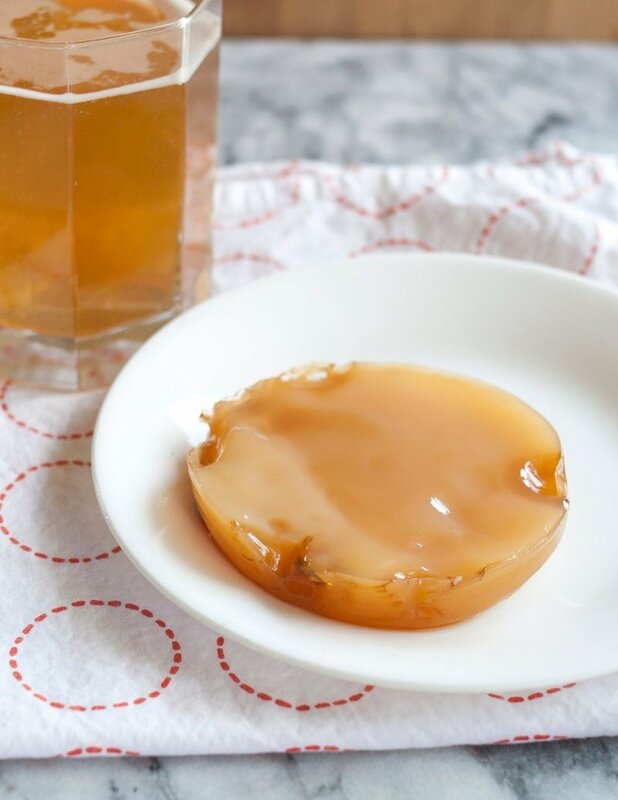 How Can You Grow a Scoby from Nothing? 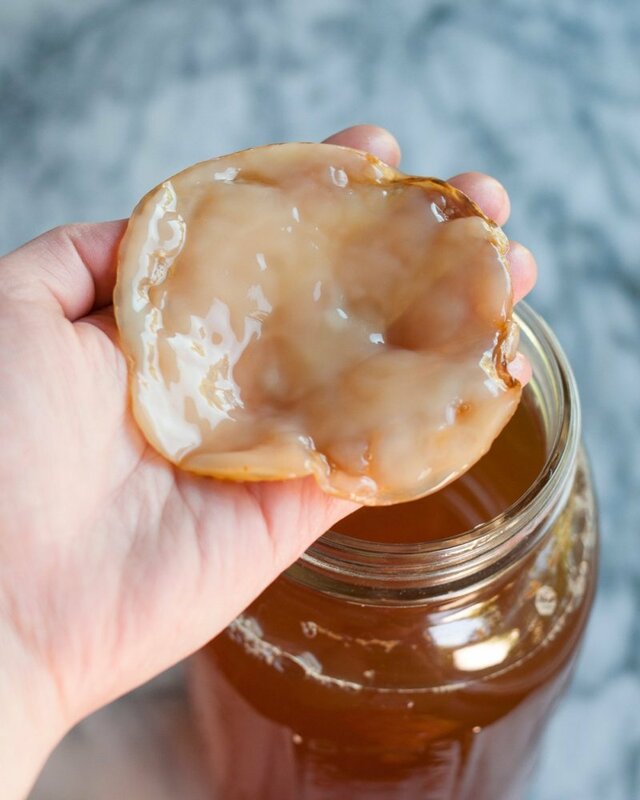 A scoby is a naturally occurring part of the kombucha brewing process. Since it’s constantly renewing itself, a new layer of scoby will grow on the surface of the old one every time you brew a new batch. You’ve also all probably bought a bottle of kombucha with a little blobby thing inside? Well, that’s actually a tiny, newly-forming scoby. This ability of the the scoby to constantly reform itself is what makes it possible for us to grow a new scoby from scratch. You grow a new scoby from scratch by combining tea, sugar, and some pre-made kombucha. 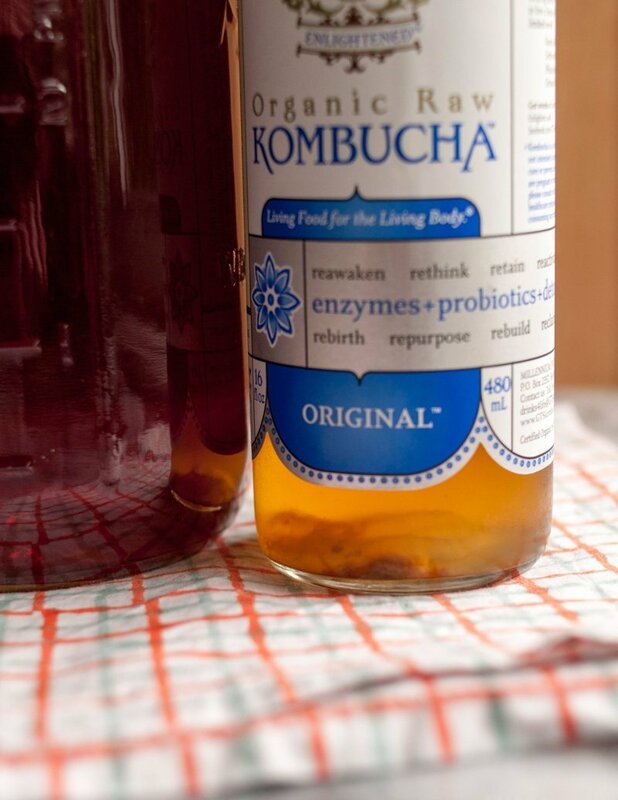 You can use kombucha that is either homemade from a friend or store-bought, but make sure it’s a raw, unflavored variety. It also helps if you can see one of those little blobby things floating at the top or bottom of the bottle. A blobby “baby scoby” is forming! 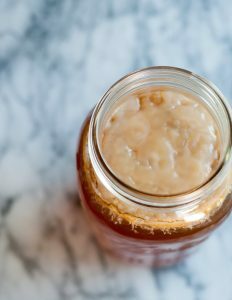 Is It Safe to Grow Your Own Scoby? Part of the job of the scoby is to protect the kombucha while it ferments, so a jar without a scoby is vulnerable to any bacteria, good or bad, that’s floating around the environment. This means that you need to be extra vigilant during this time: make sure the jar and utensils you use are squeaky-clean and rinsed of any soap residue; keep the growing kombucha covered and away from direct sunlight; also keep the jar somewhere out of the way where it won’t get jostled; wash your hands before touching or handling the scoby. Keep an eye on it and refer to the pictures in the slide-show below. Bubbles, jelly-like masses, and gritty brown-colored residue are good; fuzzy black or green spots of mold are bad. The liquid in the jar should always smell fresh, tart, and slightly vinegary (this will become more pronounced the further you are in the process); if it smells cheesy, rancid, or otherwise off-putting, then something has gone wrong. All these warning aside, I made new scobys many many times myself and never had it go wrong. There’s a bit of trust involved — it just looks gross! — but I find that if you let it be, it comes out right in the end. How Long Does It Take to Grow a New Scoby? It takes roughly 2 to 4 weeks to grow a new scoby from scratch. The time might be less if your kitchen is warm or longer if your kitchen is cool. In general, try to keep your kombucha at an average room temperature of about 70°F, and your scoby will form in a little over two weeks. Be safe: if you suspect something has gone wrong, then toss the batch and start a new one. Use your best judgement — though I know this is hard because growing a scoby isn’t exactly something most of us have done before! It’s a weird process! Know that if something is wrong, it will inevitably get worse; if it’s a normal part of the process, it will even out. How Do I Use a Scoby to Make Kombucha? → If you’re worried and not sure if things are proceeding normally or not, feel free to email Emily Christensen, or share a picture of your in-process scoby on Twitter orInstagram!! You can also purchase a mature Scoby and a complete brewing system from Dave at www.getkombucha.com.